I also have a pile of favorites stitched together by various school groups or women’s organizations such as Harstine Island Cooks or Seasoned with the Sun. Today as I’m flipping through the pages of the Silver Palate Good Times, I’m smiling at the occasional kitchen splatter and the comments that I’ve scratched in the margins over the years. I like these notes not only because they bring back a memory of a family dinner or in one case, a meal gone bad but they provide me feedback that I’m able to use as a barometer of change going forward. And someday, if Kindles and the internet haven’t wiped out the use of cookbooks entirely, perhaps my notes will add value to the contents as my sons’ and their families create holiday meals. Perhaps I’m being simplistic but what strikes me as ironic is how applicable this is in the workplace. Taking the time to offer up brief but direct feedback in a specific situation is incredible added value for employees. By telling an employee what was good and what could’ve “baked a bit longer” on a frequent basis, we have the opportunity to not only improve performance for the next time but also offer a long-term gift of employee development. The Gallup organization has a tool used to measure employee engagement called the Q12. Within the tool, one particular question reads; I have received feedback from my leader in the past 7 days. That can be hard but if we think about jotting a few comments in the margins of a cookbook and we offer it up frequently, we have an incredible opportunity. Employees, peers, even leaders become more engaged with feedback and they have real examples from which to work rather than attempting the unsavory and impossible task of managing perceptions. And our colleagues don’t have to wait for a mid-year or annual performance review but small specific examples that offer opportunities for life long growth. Where can you begin jotting notes in the margins? Prepare a hot grill. Toss zucchini and mushrooms with salt, pepper and oil. Grill, turning once until slightly brown and tender (about 5 minutes). Return to a bowl and let cool to room temperature. Gently toss with vinegar and sprinkle with more salt and pepper. Transfer to your serving dish and sprinkle with fresh marjoram. Take notes on what you enjoyed and would change and add them to the comments! Great analogy and great point. Feedback makes proactive management of cultures possible. The lack of Feedback, by definition, makes all our efforts reactive With feedback, we can discuss what occurred and begin to proactively manage the future. The speed of the feedback is also critical. It is more difficult for humans to make adjustments to behavior after the context of the behavior is forgotten. Feedback about something whose time has past is like asking a person to learn piano without allowing them to touch one. The feedback must be relevant to the feeling that drove the behavior, not to the behavior itself. Feedback allows us to build trust, to shift behavior and to teach and edify each other. We find that employee engagement and customer satisfaction increased much faster when the feedback is provided to the employee within 1hr of the event. Feedback is the kind thing to do and also the right thing to do. Thank you for your great post. It is very meaningful and relevant to me. Excellent point about the speed of feedback and probably something that I need to work on. I sometimes see something in a meeting or event. If it was great, I work to tell that person that day. If it was something that I want them to reflect on, then I save it for a more meaningful conversation. I need to think more about this because I often won’t share things that I didn’t experience myself. You make excellent points, Tammy. First, I also jot notes in the margins of my cookbooks, which are also covered in grease splatters and other foods that didn’t quite make it into the dish. Best-ever recipes literally receive a gold star. Those are the ones that no matter who comes over or how picky a kid is, they will eat it. By making small changes over time, the recipes turn into family favorites and memorized. Second, constructive feedback has always been lacking in the workplace (it is a difficult skill to learn). Rather than a “You should have…” attitude, we should try using a “How about if we try this…” suggestion to open employees and coworkers to working together to improve a project (or themselves) rather than putting someone on the defensive. This attitude also can be used at school or home with our children. Kids want to please their parents and teachers. Many of us already make suggestions or nudge them in the right direction. By having them be part of the process they gain confidence and naturally strive to a higher level. Sometimes they will take a suggestion to a totally different level that we never even considered. The same can be said about coworkers. When we make the effort to let others shine, many times they will and we all benefit. You’re definitely an “HR” professional Lisa. I have to think hard about it and am envious of others for whom offering feedback comes naturally. Thanks for “writing in the margin” of my life, Tammy! Nice blog! Have a blessed Sunday!!! What a sweet comment Judy! Hope you’re having a great day. I have cookbooks from both my Grandmothers in my kitchen and I love coming across a recipe with notes they have written on the side. I get a rush of emotion and can almost imagine them in the kitchen with me. I’m with you…….let’s keep cookbooks alive and share the love! My mother has a cookbook that my Nana (her mother) bought in sections and put together when she was a young married woman. It is several inches thick, well used, taped and restuck together. Somehow my mother was able to talk Nana out of it, as I remember Mom always having that cookbook. However, I have not been as successful and will have to work out with my sister who will get this prized possession. Just thinking about it brings back memories of the cookies my mom made from the cookbook and put into the pelican cookie jar (another prized possession). You have brought back many wonderful memories! Tammy wrote: And someday, if Kindles and the internet haven’t wiped out the use of cookbooks entirely, perhaps my notes will add value to the contents as my sons’ and their families create holiday meals. Great point A S. Perhaps I am limiting myself by thinking in my present reality. Like much of my life, I’ve streamlined the cookbooks currently on my shelves . . . but the margin notes still make the meal. Yes, Nancy. I’ve done the same. While still sporting a collection, I have also begun to “declutter” in many areas. I, too, have quite a collection of cookbooks and often find myself jotting notes about when I first tried a recipe and changes I’ve made to it on a sticky note and sticking it onto the page. I find it really helps bring back memories and improve on the recipe the next time I make it. Anyway I completely agree with your view on the constant feedback. I think constructive feedback can really help improve one’s performance at work but is always unfortunately overlooked. Yes, I agree that feedback is usually overlooked. Some see it as confrontational when it is so constructive and valuable. Hi Tammy – I’m a big believer in feedback, both positive comments and constructive criticism, to reinforce behaviors and build productivity. I like the recipe too – can’t wait to work with zucchini this summer! Yes, I just got my first zucchini delivery of the season. My job responsibility requires that I regularly give people feedback. What I find most common is that people lack insight into their own behavior and a quite appreciative to receive immediate, honest and constructive feedback. I also write in the margins of my cookbooks and started a blog for my family because my handwriting is so bad. What a great reason for a blog. And, I completely agree that direct, honest feedback is really a gift. I can honestly remember the first real feedback that I received and how appreciative I was. Thank you for stopping by my blog and commenting on my working mom’s balance post. I have received a lot of great feedback about that post in particular. I blog to connect, and I’m glad that entry connected with people. I, too, have a collection of cookbooks. They are my passion, and I am constantly looking for some new recommendations. I had never thought to make notations in them (I was a rules follower in elementary school, so the idea of writing in books, I suppose, felt a bit naughty!) What a wonderful idea! I am adding your blog to my blogroll – I am on a mission to incorporate more fresh fruits and veggies into my family’s diet (which should be easy considering we barely eat any now) and have really been working to make sure I buy as much locally as possible. So your blog is a good inspiration for me. In terms of continual feedback, this I completely agree with you. I find myself making notes as I’m watching my team lead meetings, participate in conference calls, integrate with their team. Without those daily touch points, you can’t expect those who work for you to grow and truly prosper. Thanks again for stopping by, I am so happy to have found your blog! Thanks for coming to my blog. I can definitely help you in your quest to add more fruits and veggies if you’ll stop back by. You sound like a great leader too! I’m stopping back and have added you to my “most frequently visited” blogs! What you are doing here is great! Thanks so much. I’m honored. 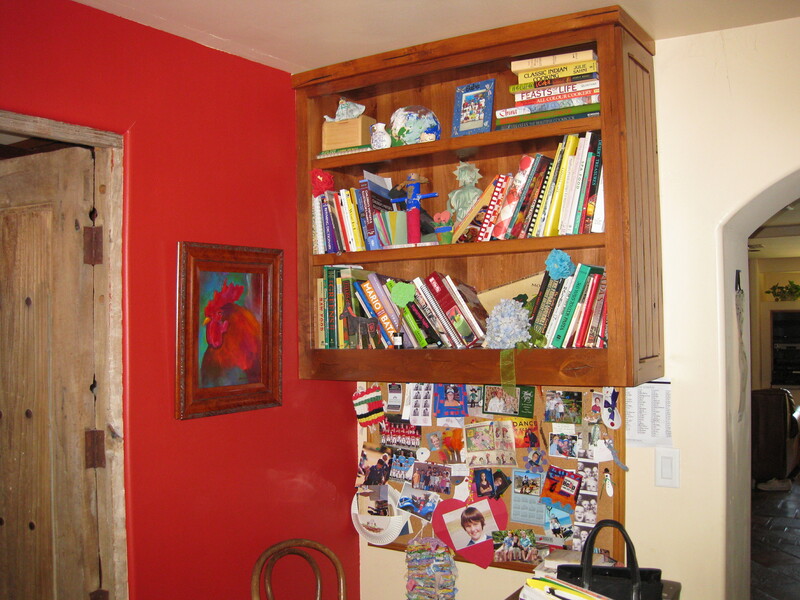 I love the red wall in your kitchen! So happy to have inspired you. You’ve inspired me! My grandmothers wrote in the margins of their cookbooks. I’ve missed them so that I haven’t been able to bring myself to pour through them. But you’ve shown me that re-visiting them can bring comfort. And I’m going to be more mindful of writing in the margins of my own cookbooks. Thanks for the nudge. I too have a large collection of cookbooks and love to read them and make plans…and even cook from them! I think this is going to be a good weekend for cooking. Those are some of my favorite cookbook categories, too! Restaurants, regional cuisine, and specifics (I have a whole book about nuts, and even one about blueberries.) I think a constant feedback loop is much more useful in making progress than infrequent critique. Blogs are pretty great places to get feedback, too! I’ve learned to write in the margins, too. It reminds me to change something if I felt it needed it to keep from making the same mistake twice. I have the “cook” cookbooks–the local, Jr. League, Silver Palate, and Southern Living books, and then the “look” cookbooks–the glossy ones that I enjoy browsing through, but know I’ll never cook from them. Direct Feedback is always helpful – to really spell out in a constructive way what one can do to improve in anything, and having people in our lives who do this in a way that allows us to grow is fantastic. Being able to do it oneself is also very important. Loved this post Tammy. Thanks June! I agree that giving feedback to one’s self is the ultimate goal – we just miss our own blindspots sometimes. Hi, Tammy–after reading your comment on my blog, I visited your site & read all the comments made above–you have had a great deal more feedback than I have on this subject–nicely done. Someone wrote about clipping recipes & putting them into a notebook–I do that too as well as collecting recipe cards & cookbooks. One of my prize possessions is one of my sister’s recipe boxes & I am still hoping to get it put into book form & published for all the family to enjoy. But having the original book or books, that’s a treasure, isn’t it? Perhaps you have come across some of the old BH&G cookbooks which encouraged owners to add their own recipes–I have found, over the years, maybe half a dozen of these books simply overflowing with clippings and added recipes. They’re irresistible. I’ve enjoyed reading all the comments made on your blog. Sandra Smith @ Sandychatter. You do a great job on your site Sandy. I like when wordpress generates possibly related posts for me to enjoy. I’m too afraid to leave margin notes in my books (I love mine to stay pristine. I’m a bit of a maniac, I know ;-P! 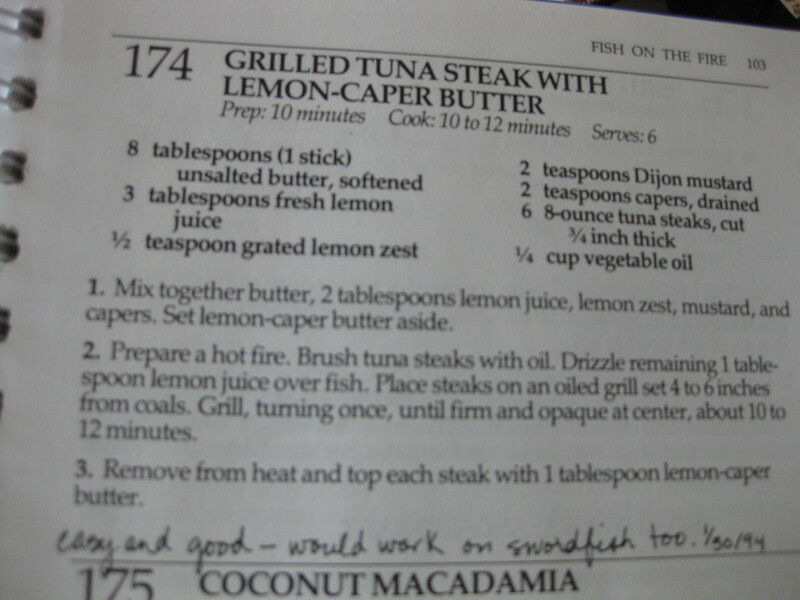 )… That recipe sounds wonderful. I know. I was a rule follower too until someone told me that books actually become more valuable with notes. It depends on your perspective. 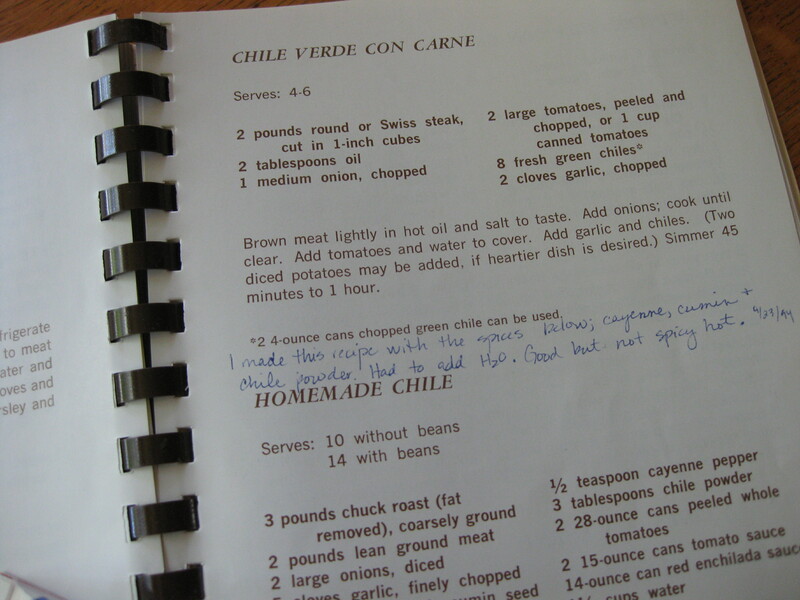 It took me years to begin writing notes in my cookbooks. I started with a small penciled star next to my favorite recipes slowly graduating to crossing out, entering my own measurements and even rewriting paragraphs. Now, my cookbooks are much more valuable than the written-free versions of my past “clean” cookbooks. This might sound silly, but I think I’d do well to jot down notes in the margins of my everyday life – to consciously think about what, and who, makes me feel better about myself/the world, and what doesn’t. I think being more conscious of this would lead to a healthier and happier life overall. Does that sound pretentious? Not at all! I think everyone should do the same. Raising your consciousness increases your ability to live intentionally. I love zucchini and grilling so this sounds like the perfect recipe for me! I hope you enjoy it. It’s certainly in season here. Thank you for the link. I’ll check it out. I’m always looking for resources to spark an idea or give me material for another post. It’s definitely important to write in the margins. I don’t know how many times I’ve forgotten that a recipe needed a change and made the same mistake twice. That’s definitely a good reason to write it down. I keep track of ways that I’ve altered it, what might’ve been good, how hard it was to make and whether or not kids liked it. A wonderful post, love your kitchen.